Contact Us — Renaissance Landscape Group Inc.
We would love to here from you and help you with any questions you have. Call or email us. If you have any questions or concerns please feel free to contact us and a member of our team will be more than happy to assist you with any more information you may require. To request a complimentary consultation please follow the link below. Get a better idea of some of the projects we are involved with and the quality of production we bring to the table. Wonderful sunshine today! Spring is around the corner. Can't wait to start sculpting some exterior spaces. 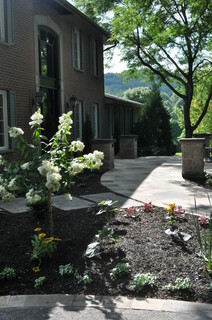 Traditional Landscape by Landscape Design Contractors Renaissance Landscape Group Inc.